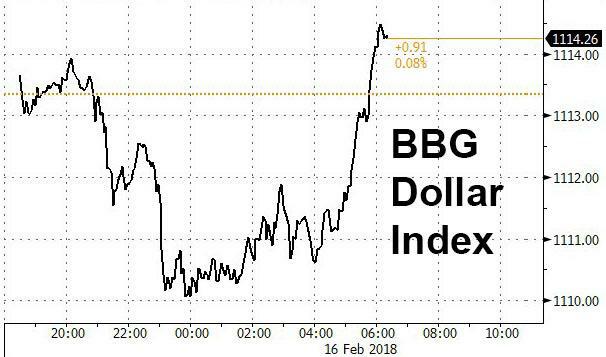 Deutsche: "Nobody Can Understand What's Going On With The Dollar... The Answer Is Simple"
Earlier this week, the bizarre, unexplainable, ongoing plunge in the dollar and US bond prices in the aftermath of the stronger than expected CPI print which also sent equities surging, prompted at least one trader at Citi to explode: "Wake Up Folks, It's Not Risk Positive"
As Deutsche's FX strategist, George Saravelos, writes, he has been getting numerous inquiries as to how can it be that US yields are rising sharply, yet the dollar is so weak at the same time? He believes the answer is simple: the dollar is not going down despite higher yields but because of them. Higher yields mean lower bond prices and US bonds are lower because investors don't want to buy them, or as he puts it "this is an entirely different regime to previous years." ... just maybe, the bottom for the dollar is now in? The mirror image to all of this is that the flow picture into both Europe and Japan has been improving dramatically anyway. We have previously written about the positive flow dynamics in Europe as the flow distortions caused by extremely unconventional ECB policy are starting to adjust. But the Japanese basic balance has also shot up to a 4% surplus in recent years helped by a big improvement in the services balance (Chinese tourists) and a collapse of Japanese inflows into the US: treasuries simply do not provide enough duration compensation any more. To conclude, embrace dollar weakness, it has more to run.